Disbursing, or selling-off an estate can be a tricky and time-consuming affair. Many items are given to family members without much thought to their value. 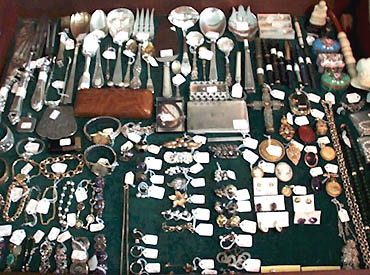 Even worse, unwanted items are often sold off in haste for a fraction of their actual precious metals, or gold value. If you are in the unenviable position of dealing with an estate, Ottawa Gold Buyers can help with the process of valuing and dispersing items with precious-metal content. Most estate assets with real value fall into one of four categories: Real Estate, Automobiles, Financial Assets and Collectibles. While there are many ways to deal with the first three categories, it is the collectible items, especially those with precious metal content such as jewelry, coins and silver flatware, that can pose some of the biggest headaches. If your family has decided to keep all of the collectible items in the estate sales, that’s great, it makes the process much simpler. But how do you divide them up fairly, and what’s the best way to determine the items’ value without selling them? A word of warning: It is best not to rely on an appraisal from a jewelry store in order to determine an item’s value. These appraisals often come with expensive jewelry and are usually inflated even well beyond a jeweler’s retail price in order to make you feel like you got a deal. Ottawa Gold Buyers offers a free evaluation service that can be used to determine your item’s value. That’s right, for absolutely no cost, you can bring your items into Ottawa Gold Buyers to have them evaluated objectively, with absolutely no obligation to sell. If your family is in the more likely situation of wanting to sell off some of the items and keep others, we can work with you to evaluate all of the items for valuation and disbursement, then purchase only the items you wish to sell. We provide honest, fair evaluations of your estate sales, and industry-leading no-obligation payouts, all the more reason to trust Ottawa Gold Buyers.